Did Sprite dilute its USP with the new 'Fridge Pack' Advertisement? Did Sprite dilute its USP with the new ‘Fridge Pack’ Advertisement? "Sprite bujhaye only pyass, baki sab bakwas"
The tag line clicked since it was too simple and realistic. A carbonated beverage is supposed to quench thirst and that’s all, period. This is exactly what Sprite marketed itself as and I presume it did reasonably well. They took digs at Pepsi by spoofing their ads is another matter though. The idea here is that the tagline became Sprite’s USP (Unique Selling Proposition). And the fact that they were able to maintain the same USP with their new and refreshing advertisements made it all the more a very effective branding exercise. All the advertisement of Sprite carried the tag line very well coupled with some very witty and cool adverts. But, the recent ‘Fridge Pack’ advertisement has me thinking if the ad has done damage to its very USP. The ad has been doing the rounds for sometime now promoting the new innovating packing by Sprite. The ad highlights the fact that the new Sprite Fridge pack is suitable for storage in all kinds of Fridge and it does it in symbolic "Sprite" witty style. The advertisement does carry forward the legacy of bearing the Sprite’s tongue-in-cheek attitude, wit and irreverence, but is it in line with the tagline that very well became its USP. But, was I not supposed to drink ‘Sprite’ for the sole reason that it was a thirst quencher. This is where the ad lost its appeal to me. If Sprite also is going to take the "Our Drink will be useful in something other then quenching the thirst" , then what on earth is different in Sprite than the other competitors. In that case, I would rather “taste the thunder” and be adventurous :). With their new tagline, I felt that Sprite also fell in the same category as the other players in the market. 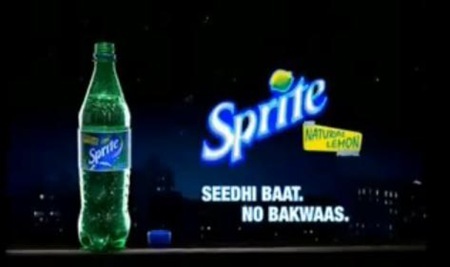 I am not sure if my thoughts on this are right on that or not, but next time when someone asks me about Sprite, I will have to say "Clear nahi hai" (It’s not clear enough). All said and done, I am not saying that the new Sprite ad is bad, infact it is pretty good in terms of execution and creativity. But, i feel that the uniqueness of Sprite element got lost somewhere. Can Tata Indicom’s Pay Per Call Concept be a revolution in Mobile Industry? 5 things that great brands do! The Hindu punches Times of India in face with this Super Creative Advertisement! Top 10 Indian advertising campaigns of 2011! thanks a lot for ur insights. Infact, the other side of ur explaination is enlightening.I was actually not able to figure out any positives or rather the motive behind the probable re-branding.A less than expected results from the ad campaign might have lead to a change in the whole ideology. But then, the way i look at it, Branding is a one time process.So, if you dont do it right the first time, it becomes a lot more difficult to make amends. However, only time will tell if the consumer actually goes into the details and decides to change preferences. I agree on many counts with you! Well this happens when people in Creative industries keep having their bubbles of energy coming up! Ideas come flying every minute! So when one person thinks of something like this and sells the idea to the entire team, they sell it to the company (Sprite). In all of this, like you have rightly pointed out, the soul of the brand gets sidelined! There could be another reason though! Maybe the advertisement “Baakhi all Bakwas” was good and cool… But was not translating to actual sales! People like the ad, think sprite is cool but maybe that was it! Many a times there are some advertisements on those lines! So maybe this is part of a major rebranding strategy. Hence they would have to come up with something like this to get people to talk! And then come up with their new creatives! Dunno if I make sense here! Just have a friend in advertising who tells me such stories! @arun thanks a lot for sharing Gopinath’s thoughts on the same.Glad he liked the artcile. and i do agree that the brands in their madness of beating their competitors forget to ensure that there brand indentity is not lost.With the case of sprite, what i found more absurd was the statement of the creative team, that “this new ad is in line with the wittiness exhibited”.Did they forget they r supposed to showcase the brand “Sprite” and not demonstrate that they have been able to dish up witty ads everytime. Once again thanks for the comment and the link to your article. Comment from Gopinath Mavinkurve through mail.